To judge by his reception in some parts of the press, it might seem as though Mahan Esfahani has single-handedly been responsible for resurrecting the harpsichord as a concert instrument. He is far from the first to promote its cause, of course, although his youthful enthusiasm, ardent evangelism and honest, unstuffy attitude to, in particular, Early Music have certainly brought it quite literally to centre stage, with solo harpsichord recitals in places — such as at the Proms where they simply wouldn’t have been found before. The harpsichord may never quite be mainstream material, but you sense that, if it were ever to get there, Esfahani might just be the man to make it happen. His debut solo recording is of music that, appropriately enough, boldly breaks rank in pursuit of new ideals. 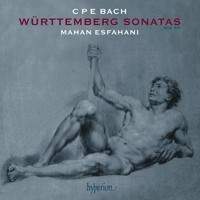 C. P. E. Bach’s six keyboard sonatas published and dedicated to his former student the Duke of Württemberg in 1 44 - are models of the unconventional, exploratory in many respects, and exemplars of the empfindsamer Stil that gave voice to the expressive concerns of a number of European composers in the mid eighteenth century. Some of the forma and stylistic characteristics of a previous generation are still present — there is more than a hint of Domenico Scarlatti’s flamboyance , and there are familiar traces of the old French ouverture beginning the sonatas in E minor and B minor, for instance, and a rather (J . S. ) Bachian two-part invention to round off the latter. But Bach’s guiding interest in the artistic s that produced such movements as Sturm und Drang is clearly evident in music of frequently changing mood and affect, and it is this sense of the unsettled, of not quite knowing what’s being aimed for or where the music is heading, that makes his music at once so interesting and so difficult to interpret well. Here is the paradox. That music intended to capture such a sensitive manner of expression should be played on the harpsichord, a keyboard instrument not known for possessing strongly expressive qualities. Bach himself preferred to play on the clavichord and wrote much of his keyboard music with that instrument in mind, precisely because its touch sensitivity brought expression under the close control of the player. Expressive control of the harpsichord is clunky and limited by comparison, and not all of Bach’s keyboard music is well suited to it. The many sudden dynamic changes in the ‘Württemberg Sonatas’ Esfahani has to achieve on the harpsichord through changes of manual or by adding or subtracting registers, and the sureness with which he does it, especially mid-phrase and at speed, with barely a breath between them, is impressive. The ‘Württemberg Sonatas ‘ are generally extrovert rather than intimate pieces, and in them Bach explores changing expression by means other than just dynamics. 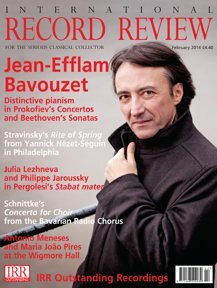 They need a virtuoso interpreter not only to bring off the more showy aspects of the writing — which Esfahani does with strong-fingered assurance — but also to make sense of the inherent strangeness of other parts of the music. The opening movement of No. 6 is an operatic scena in all but name, a recitative keenly characterized by tonal contrast as well as by phrases that peter out with little real continuity or resolution. In lesser hands the movement would fall to bits, but Esfahani makes coherence out of apparent incoherence, manages to get the music to hang together and establishes dramatic momentum, displaying an authoritative understanding of Bach’s rhetoric. The harpsichord Esfahani plays is a copy of roughly contemporary instruments by the Berlin maker Michael Mietke, chosen for its ‘singing’ tone. It’s an easy instrument to listen to: its full, percussive tutti is rich and forceful, but I particularly enjoy the soft, plump notes of its quieter sounds, given more than a little resonance. It’s well recorded too, and the gentle thumps and slides of the action help to give a realistic impression in the listening space. In the booklet, Esfahani describes the sonatas movement by movement and attempts to key them into the complex aesthetic agenda of their era. His effort to guide the listener leads to some fanciful pictorialism, which occasionally gets the better of him — he conjures up as visual aids a restless dancer and a leaping and frolicking fish — but such perceptions, if they were not in the mind of the composer, at least demonstrate a seam of analytical eccentricity that matches the capriciousness of the music itself. As for his playing, in the best sense it is anything but unpredictable: sure-minded and vividly realized, it holds the attention with ease and is a pleasure to hear. This is an excellent recording and it can be thoroughly recommended.